"I personally prefer cheesecake with a different crust rather than a graham cracker crust. Through trial and error, I have come up with this recipe using blueberries. It takes a lot of time, but is definitely worth it. Don't think about the calories!" Preheat oven to 350 degrees F (175 degrees C). Combine the butter, flour, sugar, and salt in a food processor. Process until mixture begins to form small lumps; press into the bottom of a 2-quart baking dish. Bake in preheated oven until golden brown, about 20 minutes; remove from oven. Reduce oven's heat to 325 degrees F (165 degrees C). Beat the cream cheese and 1 cup of sugar in a bowl until soft and creamy. Stir in the eggs one at a time, until smooth. Gradually stir in the sour cream, vanilla, and lemon zest. Pour the mixture over the crust. Bake until firm to the touch, 45 to 55 minutes. Meanwhile, make the topping by combining the blueberries, sugar, and cornstarch in a large saucepan over medium heat; cook until thickened. Allow mixture to cool. Pour the cooled blueberry mixture over top of the cream cheese layer. Chill assembled cheesecake in refrigerator overnight. 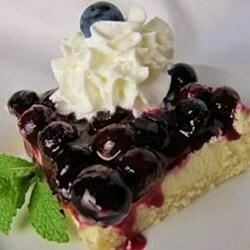 You may use fresh or frozen blueberries in this recipe. Note: The pan used should really be a 9x13 baking dish. Sorry for the mix up. I used this and took a dessert to work. Everyone loved it!